David Ovsjannikov VS. Christian Propp. #OHL - Very Barrie Colts | A website covering the Barrie Colts of the OHL. I don't think that people were too worried since last season Ovsjannikov did an excellent job of filling in for Blackwood on multiple occasions. 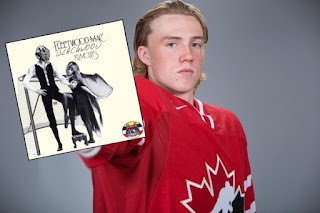 He had to fill in when Blacky was suspended for 10 games for attempted decapitation (okay, but it was a vicious slash), and also when he was off to the World Juniors. 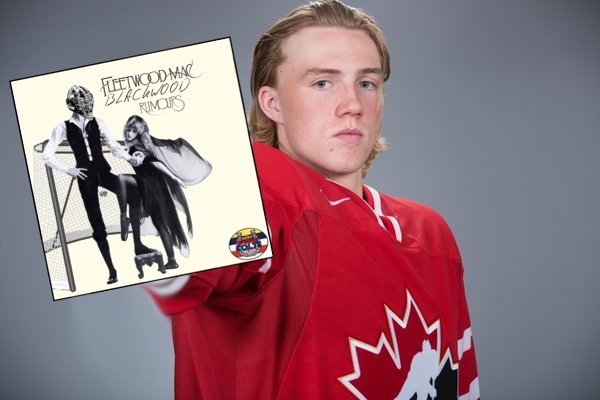 He even managed to get some VERY important games during the playoffs over Blackwood even when he was available to play. And won. The season itself saw him in 21 games with the Colts after coming over from Saginaw. He had a winning record of 12-5-0-3 with a 2.97 GAA and .915 SAV%. Many teams in the league would love to see those numbers from their starting goalie, let alone their backup. Now, it is worth noting that before we go any further, the Colts also look a lot different on the blue line. With the loss of guys like Rasmus Andersson and former captain Michael Webster, it was understood that the Colts would have a tougher time with their defensive game. Christian Propp saw 2 games last season and in those games he allowed an average of 7.61 goals against with a .733 SAV%. Yikes. Needless to say, it was clear Barrie would run with Ovsjannikov when this season started, and nobody really expected to see Propp in goal that often. In fact, it even looked like Ruan Badenhorst had a chance at cracking that backup position. Propp looked really good in the preseason and earned his spot on the roster. This is a small sample to compare but we are almost a third of the way through the regular season and I think we have ended up seeing a lot more games with Propp than anyone had anticipated early in the year. Not only has he had to play more, but has has actually been pretty good. Lets look at some of the numbers and compare. One thing is clear here and that is that Ovsjannikov's numbers compared to last year are worse over a smaller sample size and Propp's are much better over a larger sample. Again, defensively the team isn't as strong as last years but the comparison from year to year is with each goalie playing with the same blue liners. In his rookie year, I think Propp is establishing that he is the next starter for Barrie and though the Colts should continue to use Ovsjannikov as the starter, I feel it is smart to give Propp as many games as possible this year to help further his development. Either way you look at it, goaltending isn't the Colts biggest issue right now and likely wont be over the next few seasons providing that Propp continues to develop the way he has. 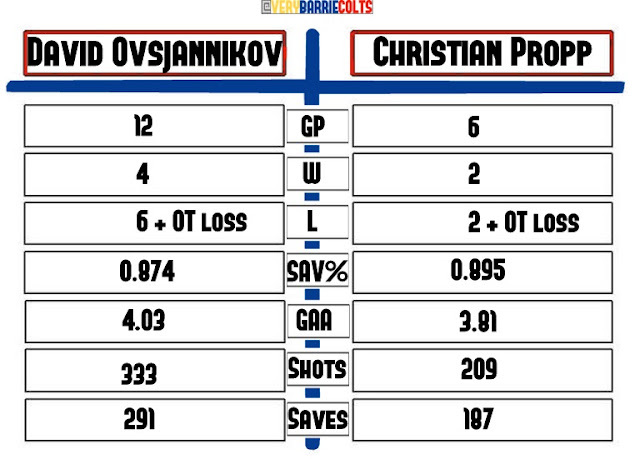 What are your thoughts on Propp and Ovsjannikov? Do you think Ovsjannikov is still the top guy or do you think maybe they should let Propp run with more starts? Let us know in the comments!